When it comes to global climate change and what to do about it, there's a meme you hear in California politics that says Jerry Brown was a man of ambition but Gavin Newsom's a man of action. It was Gov. Brown, after all, who set California's highly ambitious 2045 goal for the state to be weaned off of fossil fuels and fully shifted to an all-renewables energy matrix. Now Brown's gone and it's upon Newsom's administration to decide or declare whether the state should get onboard with an ambitious new offshore wind-farm plan released by the Berkeley-based American Jobs Project in February. "We hope that state policy leaders take a look at this," says Mary Collins, managing director and co-founder of the American Jobs Project. The American Jobs Project (AJP) paper endorses two wind farms currently under consideration for development—in Morro Bay and off the Humboldt County coast—and could add some 18,000 jobs to the California mix by 2045. 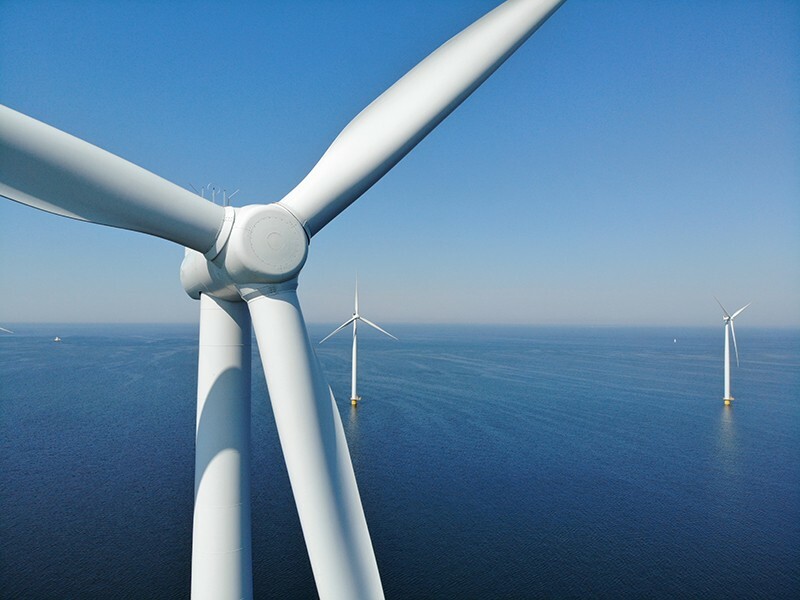 Given California's deep-water offshore challenges, the AJP proposal would emphasize cutting-edge offshore windmill technology—huge floating windmills with massive, football-field-length fins that would be tethered to the ocean floor. The AJP's jobs-focused vision also discusses future technologies such as giant wind-catching kites called Makani devices to fully leverage the renewable promise of wind energy, especially on a cloudy day. That's all very ambitious, but is it politically feasible? Newsom has taken an all-of-the-above approach as he entered office pledging to meet the 100 percent goal. As lieutenant governor he chaired the Lands Commission and in a statement online from late 2017 noted that "we must continue diversifying our energy supply—that means increasing our output of solar, wind, geothermal, hydro and ocean-based energy." The AJP is a nonprofit think tank founded by former Michigan Gov. Jennifer Granholm that was incubated out of Berkeley and has an office in the Washington, D.C., area. The organization says it's been engaged in New Green Deal–type work in 24 states over the past five years but that this is its first foray into California climate-change waters. The AJP California Offshore Wind Project: A Vision for Industry Growth proposal came about because of the 2045 goal set by Brown and pledged to by Newsom on his first day in office—and because the federal Bureau of Ocean Energy Management (BOEM) started the leasing process for offshore wind-farms development as of last year. As a result of these intersecting forces, says Collins, "We could see a federal lease as early as 2020 in California waters." The AJP has dotted the expected i's and crossed the mandatory t's in its exhaustive wind project blueprint for California energy independence—it has interviewed the fishermen, solicited input from environmental groups, gotten the public-private ball rolling, engaged in discussions with the Department of Defense, and made sure that organized labor has a place at the table. The AJP vision comes with the promise of thousands of permanent jobs in the renewable and clean-energy industry—and with big-ticket investment interest in the California project from the likes of Google, Shell and Apple. If fully implemented, the AJP says "offshore wind could be utilized to achieve 100 percent carbon-free energy, improve grid reliability, and support over 17,500 California jobs in 2045." That's a ways off. In the shorter term, Collins says there's work to be done between now and next January, but is optimistic that the various stakeholders and interested parties will see their concerns fully mitigated. Historically, onshore and offshore wind projects have been fraught with concerns over negative interactions with birds. North Coast U.S. Rep. Jared Huffman has taken an exceedingly dim view of offshore oil platforms but has signaled an openess to offshore wind farms (his district includes Humboldt County). Huffman notes that the BOEM hasn't indicated yet whether the lease procurement will be a wide-open bidding process or "whether they could go right to a decision right away with the local energy project." He'd prefer the latter option and says that while the "devil is in the details" (transmission issues, impacts on fisheries) the Humboldt project—which he's more familiar with than the Morro plan—is "a site that looks like a spot that could be appropriate. I am for it in concept for sure. We've got to find some ways to say 'yes' to projects like this—but it also has to be done thoughtfully." The conditions are very favorable in Humboldt Bay, he notes: "The wind is good, the conditions are good, and the Department of Defense doesn't need to protect it for military purposes." Fishermen have been wary of offshore wind farms because of the potential negative impacts on where they can fish, and for their gear getting torn up in the windmills. Environmentalists, and Donald Trump, have pointed to the deleterious impacts on birds. But there's been a attitudinal sea change in recent years over offshore wind farms, as the existential issue of massive global catastrophe has trumped concerns about pelicans flying into the windmill fins.